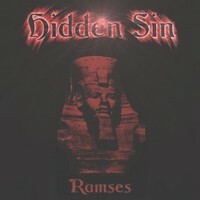 The Italian band Hidden Sin started in 2006 and now presents their first demo Ramses - the title indicates lyrically they are dealing with Egyptian history. The kick of with the symphonic intro Tales Of The Nyle which leads into Ramses II. The sextet offers a fast tune which is based in traditional heavy metal / NWoBHM. Singer Dan has a powerful voice and his clear vocals are easy to understand. Musically they are very 80's-like... A basis to start from, but if they want to have a chance they need to offer more... Perhaps the keyboard could add something, but actually it ain't audible at Ramses II. At the following The Battle Of Sands they add some Oriental sounds and Elena's keyboard can be heard in the background. The Oriental touch makes it differ from Ramses II, but I wonder why the keyboard isn't adding more uniqueness to the song... And I think they should have shortened the track, they can't keep the listeners interest. Even if the lead guitar part is well performed, but its nothing special or outstanding. After Lost In The Tomb which is the same style as Ramses II they show a bit variation with I'll Never Die. The song starts slowly and more emotional, but then they return to their 'standard', even if they vary in speed a bit. At the end they slow down again and in a kind of choir present the last words accompanied by acoustic guitars. Well, the sound of the demo is okay for a demo. But the guys have to work on their song writing skills. The songs are too old-fashioned and even if they are solidly played, it's not enough these days. Singer Dan has a powerful voice, but needs to vary more. His vocals are too one-dimensional. To focus lyrically on ancient Egypt isn't new, but there are ways to make it more interesting. But beside all the critic, I heard worse stuff and if they would have released this 20-25 years ago then it would be cool. But in the year 2007 you need more to offer. But this is their first demo and they improve.